We’ll split our application into three separate modules: game, webappp and statistics. Game is our core module, it’s where all business logic lives. It has REST API to handle commands and it publishes events to RabbitMQ. Webapp is an example user interface client consuming our game module. It’ll be created using Play Framework, AngularJS and WebSocket. Additionaly, we’ll create statistics module that’ll collect data from game’s events and expose simple REST API to get calculated dice rolls statistics. In this part we’ll take a look at game module followed by webapp and statistics in 2nd and 3rd part of this series. We’ll begin with implementing main portion of game’s logic – our domain. We’ll do it using event sourcing technique. Basic idea behind event sourcing is quite simple: an aggregate root (our game) receives (non-persistent) commands. As a result it generates persistent events that are saved to an event store (this is what Akka persistence takes care of). Right after saving, events are applied to the aggregate root, changing it’s state – it’s the only way to modify it. Having this in mind, we can restore any past state of an aggregate just by subsequently applying its saved events. On the other hand, it means that if we want to recreate the current state of an aggregate we need to take all of it’s saved events and apply them ony by one. And yes, you are right – this may be inefficient. Here’s where snapshots come into play – they are state dumps taking into account events up to a certain point in the event stream. If we have a snapshot we only need to reapply the events that happened after it’s creation to obtain the current state. Usually it’s a good idea to use them but here we’ll leave them out for clarity. Our game is an event-driven aggregate root. It’s immutable and most of its public methods return new copy of itself with some changes. Applied changes are reflected in generated events added to returned game. I decided to make Game trait responsible for handling these commands, thats what handleCommand method does. It simply dispatches commands to the corresponding methods (either start or roll). If a command cannot be applied in the current state (for example RollDice in UninitializedGame) it returns the suitable violation. Some may prefer to have handleCommandimplemented in each subclass and not in the Game trait. Either ways is fine. Apart from commands we’ll have a method to update the current turn countdown (tickCountdown). It’ll take care of updating the time left in a player’s turn as well as the turn timeout. We’ll execute this method periodically as time passes. You might have already noticed that most public methods of a game returnEither[GameRulesViolation, Game]. If a command result is a valid game (not a violation), all events generated during the command’s processing will be added to the returned game’s uncommittedEvents field. You can later publish, persist or use them in any other way. I hope they are self explanatory. We can see that if everything is fine (it’s the currentPlayer that rolls) we generate one event: DiceRolled. From the roll method we return the result of applying this event to the current game’s state. A new copy of the game is created with an updated state (here we add the rolled number to the rolledNumbers map). We also add the new event to uncommitedEvents so that the caller of roll knows what events were generated. All state changes happen as a result of events being applied. If we want to change the game state we need to generate an event and apply it. applyEvent is overridden in each of game subclasses and each of them handles different set of events. For example DiceRolled event would be invalid in uninitialized state, thus it’s not handled there. The boon of this approach is that having a list of past events we can easily restore the current game state, just by applying them one by one. This method is defined in the AggregateRoot trait that Game extends. Let’s get back to tickCountdown for a moment. Although it doesn’t handle commands, it too will generate some events. Now that we have our game logic, we can bring it to life. We’ll use Akka to run games and persist events using Akka persistence. Key part of Akka persistence is PersistentActor. It’s role is to manage event-driven state. When PersistentActor is created, first thing that it does is state recovery from its previously saved events (or snapshots). If we create an actor that had some events saved before, all these events are given before any other message is handled (incoming messages are cached internally). Only after all past events were processed PersistentActor can handle regular messages. Where do the events come from then? Akka persistence gives us (amongst other things) a persist method which we can use to save events to the journal. Journals are pluggable and there’s quite a bit of them available (including MongoDB, Cassandra, Kafka). The default one writes to the local filesystem – it’s fine for our simple project. GameActor will be responsible for managing a running game’s state (stored in it’s game field) – feeding it commands and ticking the time. We inform the sender about a command’s success or failure (CommandAccepted and CommandRejected) A note here: Using CQRS it’s not always immediately possible to tell if something went wrong. We’re lucky that our game is simple enough for this not to be an issue. If we weren’t we could just acknowledge that we started processing a command that might be completed at some later point in time. We perform other actions depending on what event was applied. Omitted here for brevity. GameActor will also take care of updating the game’s time (remember the tickCountdown method?). We’ll use the built-in scheduler for that. It will call game.tickCountdownevery second. Once it does it will handle the changes the same way it does in case of a command. I realize last two are not very RESTful, but for our simple example let’s just stick with them. We’ll use the actor-per-request pattern, creating one actor to handle each request. We handle the /game url by creating a new actor as shown below. As you can see all commands go through a GameManager. It’s responsible for creating new GameActors and passing commands to existing ones. SendCommand is send by instances of the second per-request actor we have – GameCommandRequestActor – created to handle the start and roll routes. Once a command is processed, the actor handling the request is stopped. We already know how to take some actions in our games, but how do we know what’s actually happening in them? Let’s get back to our events. For now events from our games just go to the eventStream and get forgotten. That’s not very useful. We’d prefer them to be published for consumption by external clients. There are many possibilities: from exposing a REST API for fetching recent events (polling), through a custom socket-based pub/sub implementation, to full-blown message queue systems. We’ll gear towards the latter and use RabbitMQ to publish our events. 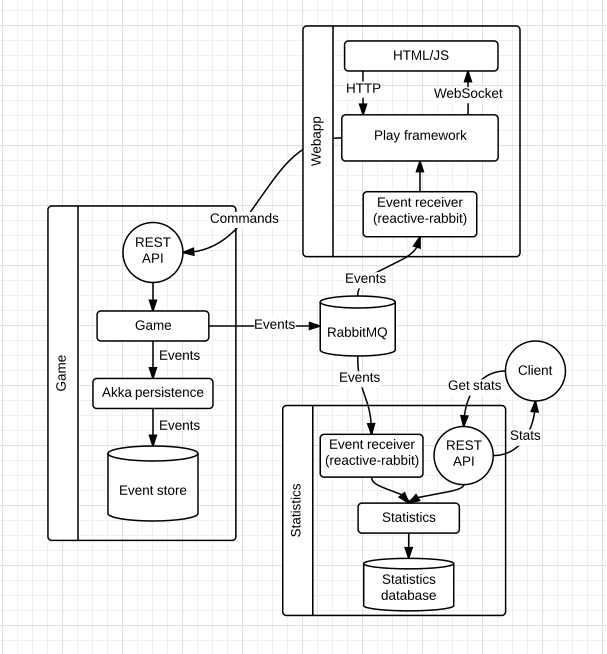 I’ll use the Reactive rabbit library to easily bind a stream (of game events) to a rabbit exchange. Our events will be sent to a headers exchange and will have gameId and typeheaders (which we can route on in our queues). Our publisher is an actor that catches game events from ActorSystem’s eventStream and publishes them (onNext) in accordance to requested demand. Once we pass an event to onNext Reactive rabbit takes care of moving it to RabbitMQ. Now that we have all the building blocks ready it’s time to wire everything up and get it running. First, let’s start RabbitMQ. I prefer to use a docker container to avoid the tedium of setting it up from scratch. Go to Queues and in “Add a new queue” section enter queue name, for example “all_games_events”. Click on newly created queue name and in “Bindings” section in “From exchange” field type “game_events” (leave remaining fields empty). This will bind our queue to all events from all games. We just started a game with two players: “Player1” and “Player2”. The game should be running and generating events now. We can clearly see that the game has indeed started and is running. Voila! The turn countdown is being updated every second, and if you wait long enough without any action you’ll surely see the TurnTimedOut event in a few seconds. Good! We’ve just rolled the dice. DiceRolled event should be generated. Let’s check our validation, what will happen if we try to roll as a player who is not supposed to roll at the moment? That’s it. Everything works fine. For the impatient there is also a web interface. Just sbt "project webapp" run and point your browser to http://localhost:9000/ to play around with it. I realize this post didn’t cover all aspects in detail, I tried to focus on most important ones and I hope it puts some light on most of them. My goal was to give you a basic idea of how a CQRS/ES-based application could look like. As a reminder you can access the full source code at Github. In the next part, we’ll create a simple web application. We’ll see how to combine REST API calls with event listening to create a decent user experience.